I Love My Hammock Time! My ENO Hammock obsession started about nine years ago. I was rock climbing at the Red River Gorge, and hiked up to a climbing area where I saw one hung up between a couple of trees. The owner of the hammock was taking a well deserved rest from climbing, hot summer temps and just relaxing. From that point on, I was on a mission to get myself one! I now have a single nest, double nest, bug nets, and slap straps for my hammocks, and an ENO lounge chair. Additionally, both of my boys have their own double nest hammock, which is an investment that can last them a life time. 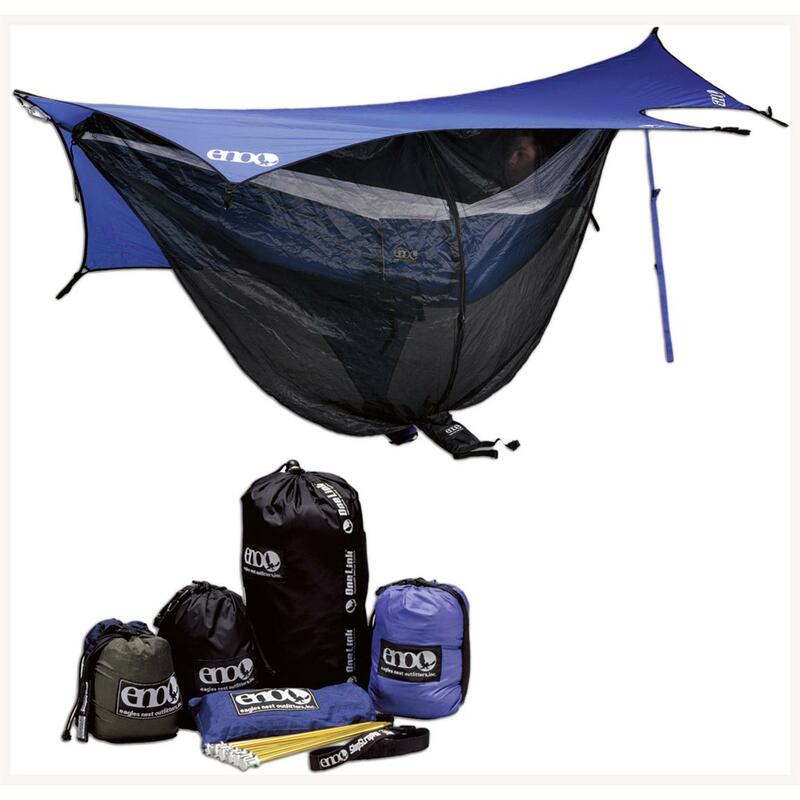 What is the big deal about ENO products you ask? They are light weight (17 oz. for the Single Nest), pack down small (3.5 x 4.5 in. for the Single Nest), strong, durable, easy to set up and dry quick if they get wet. No matter what adventure I’m on, I have one of my ENO products with me. When I’m on my rock climbing adventures I enjoy my afternoon siestas, that is for sure! Doing this in my hammock helps me to recharge my batteries, and take on more vertical play time on the rock that I call home at the Red River Gorge! Typically my friends and I set up an ENO lounge area when we get to our climbing destination. 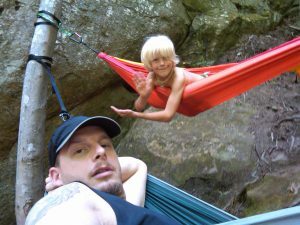 My son Terje and I hanging out at a climbing area at the Red River Gorge. The standard call out after we hang up our hammocks is “these hammock are community property for all to enjoy if anyone wants to relax in one.” It makes for a fun and relaxing day for everyone that happens to be at our chosen climbing area. Often times, new friends are made from fellow climbers that have traveled from abroad to climb at the Red River Gorge. I also carry my ENO gear in my general travels and adventures! Some of my best nights of sleep, and most impactful memories to date with my boys, have been sleeping under the stars together in our ENO hammocks. My favorite specific memory was when we were at Zion National Park. The sky was crystal clear with no light pollution. The stars were vivid and bright. You could see the silhouette of the rock cliffs, towering high above, as they surrounded us. The cool thing about ENO products is you don’t have to be a rock climber or go on big adventures to have a need for them! An example of this is how I setup a place for my boys hammocks in their bedrooms. I simply put a couple of eyebolts into the walls, securing them into studs. The hammocks hang above their beds and many nights they choose to make that their sleeping space. If they have friends over it allows them the ability to hangout and sleep near there friends. Although, often time there friends are the ones in love with the hammock setup and end up sleeping in them. I can only imagine the conversations my boys’ friends have with there parents once they get picked up from my house. Friends and my son Ezra hanging out at a climbing area at the Red River Gorge. I even setup a system in our 1987 VW Vanagon Westfalia for ENO Hammocks. Two hammocks can span the inside of the Westy when it is parked. This provides a quick sleeping setup for my boys if it is needed. ENO Hammocks also make a great gift for a family or just one person. I’ve done this with my loved ones, and it is known that uncle James loves his hammock time. For me, it is nice to know that they are creating memories in their hammock as well. In summary, having an ENO Hammock should be a standard item in your inventory of important gear to own and use!